The Pride Celebration is a social venue for the lesbian, gay, bisexual, transgender, queer, gender diverse and sexual minority community. While it is primarily a community event, it also exists for families, friends, allies and guests from all over the Northwest. 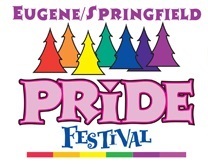 The Eugene/Springfield Pride Festival is organized each year by a committee of dedicated and resourceful volunteers. Please contact any of our committee members below for more information about how to get involved. Assist vendor coordinator with placement of vendors in the established map, be a liaison to the vendor coordinator and vendor. Assist with setups for some vendors, some heavy lifting could be required. Assist Entertainment coordinator with backstage and other duties as assigned. Greet and interact with guests entering/exiting the festival. Answer questions and work with pride committee members. Work with Security team to ensure optimal utilization of all parking areas and maintain safety of all guests while following city and state regulations. Assist with traffic flow if needed. Evaluate parking to ensure optimal utilization of all parking areas and maintain safety of all guests while following city and state regulations. Assist with traffic flow if needed.